"The old white sportswriters said the flicking, shying kid with the silly doggerel would get knocked into the ringside seats with one punch," Sally Jenkins wrote Saturday for the Washington Post. 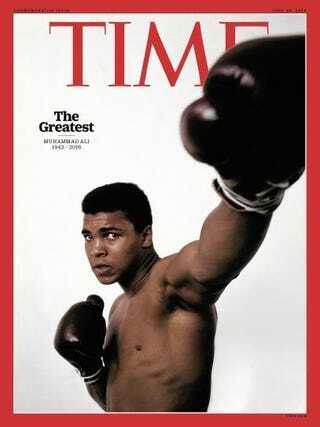 "It was 1964, and Cassius Clay hadn’t yet butterflied into the mythic champion Muhammad Ali. He was still incubating in a sweltering Miami Beach gym, where the aging opinion-makers in their narrow neckties watched him work out, disapprovingly, as he rapped out verses on the heavy bag with his light gloves, whap-whap-whap-wump. "The rumor was that he was hanging around with Malcolm and the Muslims. But even worse was the way he fought. The kid ran from a punch. "He was still emerging, just a nascent 22-year-old 'whose face turned to cameras as flowers answer to the sun,' as his biographer Dave Kindred would write. For just 25 cents, anyone could go watch him work at the 5th Street Gym, an airless, low-ceilinged hotbox up a wood staircase in a slummy part of Miami Beach. "Somehow with just 19 pro victories he had quick-lipped his way into a world-heavyweight bout with Sonny Liston, the gangsters’ pal with the truncheon fists, against whom he was an 8-1 underdog. 'He was box-office sacrifice,' remembers Robert Lipsyte, then a 26-year-old sportswriter sent to cover him by the New York Times, because the main boxing writer considered him too insignificant to bother with. . . .
Jenkins also wrote, "Almost nobody believed in the challenger, or understood who he was. Nobody. The promoters had such trouble selling tickets to the fight that they cautioned Clay to keep his Muslim conversion quiet. Talk got around anyway that Malcolm X was coming to Miami and there was someone in his camp from the Nation of Islam, which only made the older white sportswriters more suspicious. "Red Smith didn’t like those 'unwashed punks' of the counterculture. Joe Louis was the right kind of dignified black champion; he kept his mouth shut and called columnist Jimmy Cannon 'Mister.' . . ."
Still, Neil Best wrote Saturday for Newsday, "Muhammad Ali was not the first athlete to understand and exploit modern media hype, but no one came close to mastering the art in its early form quite like the famed boxer, who died Friday night at age 74. "Some journalists of the era were baffled by him. Others were offended, a common occurrence for unconventional public figures of the 1960s as society underwent radical upheaval and generations clashed. "But for those who got Ali’s jokes, and who accepted his serious side, he was a media gift that kept on giving and who did well by his chroniclers. . . ."
In death, early fears that Ali would be sanitized and deracinated were unrealized. African American writers, particularly, emphasized his racial pride but also his imperfections. Ishmael Reed, New York Times: Muhammad Ali: Worshiped. Misunderstood. Exploited. "Hillary Clinton secured the delegates needed to clinch the Democratic nomination Monday night, according a tally by the Associated Press (accessible via search engine), crossing a historic milestone as she campaigned in California and pushed to end a long presidential primary campaign on a high note," Colleen McCain Nelson reported Monday for the Wall Street Journal. "Mrs. Clinton, who was only 23 delegates shy of the 2,383 needed for victory after Sunday’s Puerto Rico primary, received commitments from additional delegates late Monday. Just a day before Tuesday’s contests in California and five other states, Mrs. Clinton emerged as her party’s presumptive nominee and the first woman to lead the ticket for a major U.S. political party. "The former secretary of state had been expected to win the delegates needed to secure victory in Tuesday’s primaries, but a last-minute show of support from a number of superdelegates pushed her across the finish line a day earlier. . . ."
"An embattled Donald Trump urgently rallied his most visible supporters to defend his attacks on a federal judge's Mexican ancestry during a conference call on Monday in which he ordered them to question the judge's credibility and impugn reporters as racists," Kevin Cirilli, Michael C. Bender and Jennifer Jacobs reported Monday for Bloomberg. "There was no mention of apologizing or backing away from his widely criticized remarks about U.S. District Judge Gonzalo Curiel, who is overseeing cases against the Trump University real-estate program. The reporters also wrote, "A clearly irritated Trump told his supporters to attack journalists who ask questions about the lawsuit and his comments about the judge. "Suggesting a broader campaign against the media, Trump said the campaign should also actively criticize television reporters. 'I'd let them have it,' he said, referring to those who Trump portrayed as hypocrites." "BuzzFeed has pulled out of an advertising agreement with the Republican National Committee over objections to Donald Trump's rhetoric," Hadas Gold, Mike Allen and Alex Spence reported Monday for Politico. "The buy was for $1.3 million, a source close to BuzzFeed told POLITICO. The source said that the main consideration was the site’s employees — that BuzzFeed could not countenance 'having employees make ads, or working at the company and having our site promoting things, that limit our freedom and make it harder for them to live their lives.' . . ."
Luisita Lopez Torregrosa, NBC News Latino: Analysis: Will The Year of Trump Propel Latinas to U.S. Senate? "It’s a common rite of journalistic passage: the night cops beat," John Eligon wrote Saturday in the New York Times' Race/Related newsletter. "Many news reporters have started out working overnights tethered to a police scanner and telephone, ready to march to the latest crime scene. "Last week, I joined about two dozen of my New York Times colleagues to take this practice to the extreme. "A team of reporters, editors, photographers, videographers and social media experts gathered in Chicago over the Memorial Day weekend to document how Chicago was grappling with its intractable problem of street violence. "The Times, of course, has had a bureau in Chicago for decades. Our bureau chief, Monica Davey, is a daughter of the city who has regularly covered some of the maddening, high-profile cases of senseless violence there. But this time we set out to go beyond individual incidents; we joined Monica to collectively explore the trickiest question of all: Why? "Working shifts that spanned around the clock, we dispatched journalists to every report of someone being shot. We monitored the police scanner and social media. At each scene, we sought to talk to the people involved in the shooting, the people who live in the neighborhoods and, when we could, the emergency responders. "Our goal was to stitch together an on-the-ground account of what this tragic violence looks like — to bring readers with us and connect them to the emotion and the experience, even if they’ve never visited Chicago. . . . "
"Roots had a respectably steady four-night run, despite ample competition from the NBA and the start of broadcast's summer reality blitz," Michael O'Connell reported Friday for the Hollywood Reporter. The reimagining of the 1977 miniseries also prompted opinion pieces after rapper Snoop Dogg called for a boycott in an expletive-filled selfie video, saying, "I don't understand America. They just want to keep showing the abuse that we took hundreds and hundreds of years ago. But guess what? We're taking the same abuse. Think about that part. When you all going to make a (expletive) series about the success that black folks is having. The only success we have is Roots and 12 Years A Slave?" O'Connell continued, "The miniseries, simulcast on sister networks History, A&E and Lifetime, concluded Thursday night with 4.2 million viewers. No same-day showing matched Monday's 5.3 million-strong premiere, but the interim marked a very stable string for the eight-hour event. Tuesday's installment averaged 4.6 million viewers, while Wednesday climbed back up to 4.8 million viewers. . . ."
O'Connell also noted, "the project is also a prestige play — premiering just within the window of Emmy eligibility. Emmy voting kicks off June 13, with nominations for the 2016 show set to be announced July 14. . . ."
Natasha Lightfoot, Nadra Kareem Nittle, Danielle Belton, R. Scott Heath: New York Times "Room for Debate": Do Dramas About Slavery Stifle Tales of Black Lives Now? Leonard Pitts Jr., Miami Herald: ‘Roots’ is reality. Deal with it, Snoop! "Hollywood has a long way to go in diversifying its ranks of actors, writers and directors," Gary Levin reported Thursday for USA Today. "But the network-TV business is miles ahead of its movie-studio counterparts, according to an analysis of the new primetime schedules announced last month. ABC and Fox are leading the way, while inclusiveness in new CBS series lags. . . ."
"Waverly L. Easley worked hard to maintain The Philadelphia Tribune as the longest-running African-American newspaper in the country," the Tribune said in an editorial Friday. "And for that hard work and dedication, we say thank you. A former president of The Tribune, Easley died Saturday, May 28, 2016 at the age of 91. He spent 35 years here at The Tribune, first working as business manager, then controller, then executive vice president/general manager before finally ascending to helm of the paper as president and CEO. . . ." News story. "UC Berkeley political scientist and professor of law Taeku Lee is part of a team leading a newly announced, expanded study of the experiences and attitudes of Asian Americans in the most extensive look to date at the nation’s fastest-growing racial group," the university announced on May 31. "The research, backed with $507,000 in funding from the National Science Foundation, will be conducted this year and published in summer 2017. . . ."
Alison Bethel McKenzie, who left the International Press Institute in Vienna, Austria, at the end of 2014, is heading for Bangalore, India, to become visiting professor for print and investigative journalism at the Indian Institute of Journalism and New Media for the academic year 2016-17. Vice Dean Kanchan Kaur messaged Journal-isms, "We look forward to having her on campus. I'm sure her vast experience will bring depth and vigour to our programme." After a journalism career that included stints at the Boston Globe, the Detroit News and Legal Times, and training journalists overseas, Bethel McKenzie joined IPI in 2009 and later became the first African American to head an international press freedom organization. She told Journal-isms that she is starting an MBA in media leadership and will remain vice president of the Media Institute of the Caribbean. "About two months ago, Raleigh businessman Smedes York read that Orage Quarles III was retiring after 16 years as president and publisher of The News & Observer" in Raleigh, N.C., Executive Editor John Drescher wrote Friday. "York, a former mayor who’s active in civic affairs, wrote Quarles a note. You need to stay right here, York wrote. Quarles, 65, retired Friday. York will get his wish: Quarles, who grew up in California and worked for several papers there, and his wife will remain in Raleigh. Quarles’ successor has not been named. . . ."
In Cambridge, Mass., "A former WCVB photographer was honored Saturday by having a corner of Cambridge dedicated to him," the station reported on Saturday. "The city of Cambridge renamed the corner of Copley and Fayweather streets the Robert N. Wilson Square in honor of the late Robert Wilson who passed away in 2014. . . ."
"Malcolm Gladwell is moving his unique takes from the written world to the audio realm with the launch of Revisionist History, a new podcast from the Panoply network," Chris O'Shea reported Monday for FishbowlNY. "History will feature Gladwell reexamining overlooked or misunderstood people, places and events from the past. . . ."
"Cordell Eddings, a Bloomberg News reporter covering bonds and corporate finance, has left the news agency for a job as a senior editor at Group SJR, a content marketing firm," Chris Roush reported Friday for TalkingBizNews. "Eddings had been at Bloomberg in New York for eight years. . . ."
"David Gilkey, an NPR photojournalist who chronicled pain and beauty in war and conflict, was killed in Afghanistan on Sunday along with NPR's Afghan interpreter Zabihullah Tamanna," Eyder Peralta reported Sunday for NPR. "David and Zabihullah were on assignment for the network traveling with an Afghan army unit. . . ."
"Gunmen suspected of belonging to Somalia's Islamist al Shabaab group shot and killed a female journalist working for state-run radio on Sunday, police said," Abdi Sheikh reported Sunday for Reuters. "Major Nur Ali, a police officer, said Sagal Salad worked for Radio Mogadishu. . . ."
Richard Prince's Journal-isms originates from Washington. It began in print before most of us knew what the internet was, and it would like to be referred to as a ”column.” Any views expressed in the column are those of the person or organization quoted and not those of any other entity.